Did You Know There's A New Graphic Novel Featuring A Desi Female Superhero? A new graphic novel featuring an Indian female superhero is in the process of being released, and here’s how you can be a part of this. 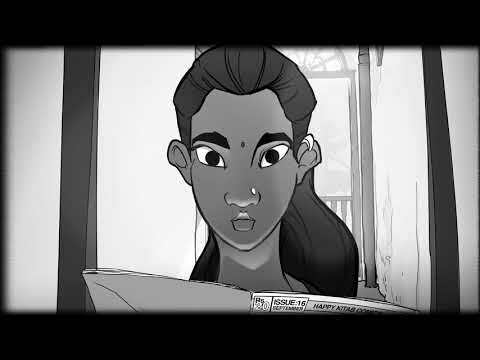 Black Sari, a three-part graphic novel by Evan Carpenter is the story of Meena, the protagonist and the superhero of the novel. For decades we’ve had the Marvel superheroes ruling the rooster. And now with Black Sari we will be introduced a new superhero, and our very own Desi one. Meena is a survivor of human trafficking and the entire series will be told in the form of Meena’s narration to people. She fights for the cause and wants to put a stop to human trafficking, an extremely rampant social problem in Asia. In his words, “she’s the opposite of Tony Stark and the Ironman kinds”. The germ of this novel was planted by Evan’s extensive travel across India and Nepal. Evan first came to India back in 2005 as an anthropology undergraduate student for research on his thesis. This cemented his bond with India and in turn only made sense for him to base it out of India. Meena’s story is based out of a fictional town of South India inspired from his time in Coimbatore and Chennai. You can watch the kickass trailer and get a sense of Meena and her tales. It’s a refreshing graphic novel where we see an Indian woman be the superhero. Though she doesn’t have supernatural powers, Evans tells us categorically. He compares her to Batman, a guy who saves Goliath on the basis of money and all the fancy gadgets that aide him in beating the bad guys. Meena, on the other hand, doesn’t have the gadgets or the money. Instead she has her wits intact, and that’s what he wanted to portray. The base of the illustrated novel is human trafficking stemming from Evan’s work as a documentary filmmaker. He also has taken inspiration from the women he met in India and observations about the society. In fact, the entire novel has been illustrated by Evan. He signed up to learn to draw something which he anyway did as a kid. With this novel, he unleashed his creativity and researched a lot before getting to designing the characters and the scenes. The first novel is tentatively centered around Meena and the Monk, a Buddhist Monk from the unknown parts of Asia. Meena will be seen recounting her stories to different people through the series, people who will play a pivotal role in these novels. You can support his novel by pitching in to help him with the printing cost. The campaign is on kick-starter and any monetary donation is welcome. The novel is expected to release by April 2018. The books will be shipped from the US but Evan has told us he is planning on discounting it for the Indian readers. You can donate by going here on Kickstarter and pledge an amount you like.